MiLBYs are the end-of-season awards that honor the best players, teams and performances of the Minor League season. For three weeks, fans chose their favorites in 11 categories, and now we're announcing the Fans' Choice winners as well as MiLB.com staff picks for the major awards. Relief pitchers are the unsung heroes of the baseball world -- hired guns called upon to throw a handful of pitches before disappearing into the dugout. But obscurity has never been an issue for Ben Rowen. The 23-year-old has dazzled his way through the Rangers system while employing one of the unique deliveries in all of the Minors. Rowen is a true submarine pitcher, bending deeply at the waist on the mound and swinging his throwing arm down rather than over the top, releasing the ball inches above the ground -- a style reminiscent of former A's reliever Chad Bradford. His pitching style is far from a sideshow, however, as the 6-foot-3 right-hander compiled a 5-0 record with a 1.57 ERA and 19 saves as the closer for Class A Advanced Myrtle Beach this season, earning both Reliever of the Year honors in the Carolina League and our pick for the MiLBY Award as the Minors' Best Relief Pitcher. "Wow, I mean I'm kind of surprised," Rowen said when told of his selection. "I had a fun year and it was a great time down there in Myrtle Beach. I know statistically I had a pretty good year. I'm just surprised that out of everyone it's me." In his three seasons since being selected by Texas in the 22nd round of the 2010 First-Year Player Draft, the California native has been nothing short of dominant, holding opponents to a .201 batting average at stops at the three levels of Class A ball while never finishing with an ERA over 1.98. An improved level of control was evident in Rowen's game this season as he walked just three batters with 52 strikeouts over 57 1/3 innings. Both numbers were career bests. From June 4 to July 14, Rowen made 23 consecutive appearances -- totaling 31 2/3 innings -- without allowing a run, converting 15 of 15 save opportunities for the Pelicans. "I think being an unconventional closer this past year was definitely an advantage," he said. "Going in there in the ninth inning to shut the door, the other hitters have to adjust to something they don't usually see or haven't seen before. Mentally and just physically, the way my ball moves, I think it's an advantage." Unlike many fireballing closers, Rowen does not throw hard (his fastball tops out around 81 miles per hour) and instead relies on precision command of his fastball and slider and the unique trajectory his submarine motion gives those pitches. Rangers vice president of player development Tim Purpura has been observing Rowen, along with other top Minor Leaguers in this year's Arizona Fall League, and says one of the young pitcher's greatest strengths is the "repeatability" of his pitching motion, which helps Rowen disguise from the batter which pitch is coming. "I think his delivery is much more repeatable now," Purpura said. "The key to the submarine delivery is having that deception, and coming out of his hand the fastball looks the same as the slider, which is what you want. I think he's gained a lot of confidence, coming to the Fall League was a huge thing for him. I think it's shown him what we see -- that he can develop into a Major League pitcher. "At the [Major League] level, you're always looking for that pitcher who has a little bit of a different look. Maybe a different arm action or some sort of deception that you can use to fool hitters." It was a lack of top-end arm speed that led Rowen to adopt this unorthodox delivery in the first place under the direction of Evan Fujinaga, his coach at Palos Verdes (Calif.) High School. "It happened back in high school," Rowen said. "My coach wanted me to start messing around with arm angles and eventually get to submarine, but all through high school I was throwing sidearm. Then when I got to college I started throwing full submarine. So it's been about six or seven years since I've been throwing like that. Throwing over the top actually kind of hurts my arm now." 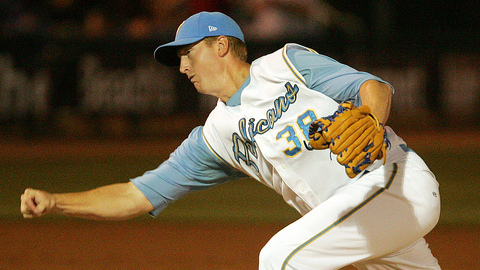 Not highly recruited out of high school, Rowen played two years at nearby Los Angeles Harbor Junior College, earning team MVP honors as a sophomore in 2008 (6-0, 1.34 ERA in 40 1/3 innings pitched) before transferring to Virginia Tech. Rowen blossomed in Blacksburg, his submarine delivery now fully developed. After posting a pedestrian 4.64 ERA in a team-high 30 appearances as a junior, he spent the summer competing in the elite Cape Cod Baseball League, becoming one of the top relievers on a Cotuit Ketteleers team that lost in the league finals. Returning to Virginia Tech for his senior season, Rowen led all Hokies hurlers with a 2.67 ERA and lowered opponents' batting average against him from .313 his junior year to .213 by the end of his senior campaign. After proving he can be successful at the lower levels of the Minors, Rowen is currently honing his craft for the Surprise Saguaros in the Arizona Fall League, the invitational league in many of each organization's top prospects compete together. With the exception of one rough outing -- giving up three runs on three hits and a homer against Mesa on Oct. 12 -- he has thrived against the improved competition, holding opponents hitless in his four other appearances thus far. "I'm going to come out here and try a few new things, pretty much just testing out a few new approaches to batters," Rowen said. "There's nothing too crazy out there that I'm trying. I think it's just going to be a good test out here seeing better hitters -- guys that have been in Double-A and Triple-A who are more patient -- and I think being out here and getting that exposure is really going to help me out." Purpura praised the submariner's AFL performance, specifically commenting on his ability to induce predictable ground-ball outs. "It's almost uncanny," Purpura said. "I've watched him here in the Fall League and -- particularly with right-handed hitters -- they always seem to hit it to the same spot at shortstop [against him]. It's just the way the ball comes out of his hand and how he has that great sinking action." Rowen is also spending the fall under the direction of former Major Leaguer Brian Shouse, a sidearm reliever who pitched in 185 games for the Rangers from 2003-06 and now serves as the Saguaros' pitching coach. "We've got a good role model for him on our staff in Brian Shouse," Purpura said. "Brian was a lefty and more sidearm than submarine, but he got quite a few years in the big leagues. [He shows] that it's definitely doable -- you can get guys out in the big leagues throwing 70 to 75 [mph]." Following in the footsteps of Shouse, 2012 postseason star Darren O'Day of Baltimore and other unconventional relievers to the Majors is Rowen's long-term goal, but for now his sights are set on the Texas League as he hopes to earn a promotion to the Rangers' Double-A affiliate in Frisco. "My progression is just like any other Minor Leaguer pretty much," he said. "I'm proving myself at each level and just waiting to get my opportunity. I have to be ready when that comes. If I get a chance at Double-A next year, I'm going to be ready for it after working hard this offseason. I'm just going to be prepared." "He's one of those guys that you kind of pull for," Purpura said, "because he wasn't a really highly drafted player but he's made the best out of what he has. There's a lot of guys who are pitching like that in the big leagues." Zack Cox is a contributor to MLB.com. This story was not subject to the approval of the National Association of Professional Baseball Leagues or its clubs.